With his latest thriller, Eagle Eye, premiering in some countries next week, suddenly hotshot director D.J. Caruso (Disturbia) is already hard at work on his next project, an adaptation of Brian K. Vaughan’s comic book series Y: The Last Man. The script, written by Disturbia scribe Carl Ellsworth, was submitted to Warner Bros last week, which some insist is big news but actually isn’t at all since Y: The Last Man is a DC/Vertigo series, and thus belongs to Time Warner. According to Wikipedia, Y: The Last Man is “about the only man to survive the mysterious simultaneous death of every male mammal on Earth”. Planned for 2010, the film will unite Caruso and star Shia LaBeouf for the third time. Caruso is reportedly considering Alicia Keys (The Nanny Diaries) for the part of the hero’s “protector”, 355 and has stated that the hero’s pet monkey will be real, not CGI. 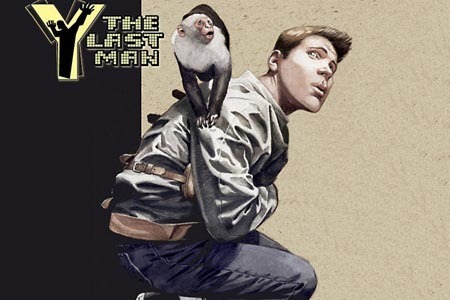 Y: The Last Man will be the first part of what is hoped to be a trilogy and will adapt the comic’s first 14 issues. This entry was posted in American Films, Comic Book Movies, Science Fiction Movies and tagged Alicia Keys, Brian K. Vaughan, Carl Ellsworth, D.J. Caruso, DC Comics, Disturbia, Eagle Eye, Shia LaBeouf, The Nanny Diaries, Time Warner, Vertigo, Warner Bros, Y: The Last Man by Mr Hollywood. Bookmark the permalink.